As the name implies, Yellow-crowned Night-Herons are most active at dusk, dawn and during the night, feeding in the same areas that other heron species forage in during the day. While some birds breed on coastal islands along the Atlantic coast, this species primarily inhabits forested wetlands, and swamps in the southeastern United States, and through most of Central America and northern South America. They winter along the Atlantic and Gulf coasts and southward. They are present in Tennessee from late March through October, breeding in scattered locations across the state, but mostly in the forested wetlands of West Tennessee. Description: The adults of this rather stocky heron have a black head with a white cheek patch, and yellowish stripe on the top of the head. The bill is thick and black, the eyes are red, and the body is gray. Immature birds are brown with tiny white spots on wings, narrow, indistinct streaks on their underparts and have a black bill. They will keep this plumage for their first year. Males and females look similar. 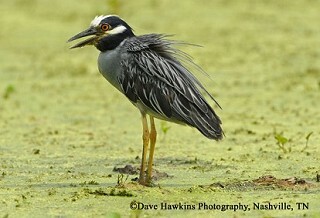 Immature Black-crowned night-herons have partly yellow bills, larger wing spots, and shorter legs. Habitat: Various wetland habitats, including, swamps, marshes, ponds, and slow moving wooded streams. Nesting and reproduction: Unlike most herons, Yellow-crowned Night-Herons will nest singly or in small colonies. They begin nesting before most herons and start egg laying by the end of March. Clutch Size: Usually 4 to 5 eggs, occasionally up to 8. Incubation: Both parents incubate for 21 to 25 days. Fledging: Both male and female feed young regurgitated food. At the age of 4 weeks, the young climb on branches around the nest, and begin to fly at about 5 weeks. The young will return to the nest for another 3 weeks to roost and be fed by adults. Nest: Both members of the pair build a substantial platform-nest of sticks, often lined with grass or leaves, in tall trees. Nests from previous years are often refurbished and nest heights in Tennessee range from 15 to 75 feet above the ground. Status in Tennessee: The Yellow-crowned Night-Heron is a rare to uncommon summer resident in Middle and East Tennessee and fairly common in forested wetlands of West Tennessee. They arrive in March and depart in October. The population appears to be increasing based on Breeding Bird Survey results. Yellow-crowned Night-Heron occasionally prey on small turtles. Their stomach secretes an acid capable of dissolving the shells. Unlike other night-herons, Yellow-crowned Night-Herons are sometimes active during the day as well as at night. Watts, B. D. 1995. Yellow-crowned Night-Heron (Nyctanassa violacea). The Birds of North America, No. 161 (A. Poole and F. Gill, eds.). The Academy of Natural Sciences, Philadelphia, and The American Ornithologists' Union, Washington, D.C.